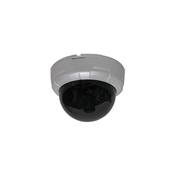 This tamper and vandal resistant turret camera is weatherproof and designed for outdoor use. It has Sony video electronics, anti-vandal features, and an integrated lens separator that eliminates IR haze and a Sony color CCD video sensor for clear, sharp imaging. The "ball" construction makes it easy to adjust in the field.